In fall 2005, my father came to live with me unexpectedly. I was caught off guard when he asked me how to use the coffee maker, as he had been a coffee drinker all his life. As the weeks went by, it became more and more obvious that my father needed more than a housemate; he needed the support of a caregiver. Caregiving for an aging parent or loved one can seem daunting, especially because—like me—many caregivers are unexpectedly thrown into their roles. But caregiving can also be extremely rewarding. Here are some tips to help you stay positive and create a comfortable environment for everyone. 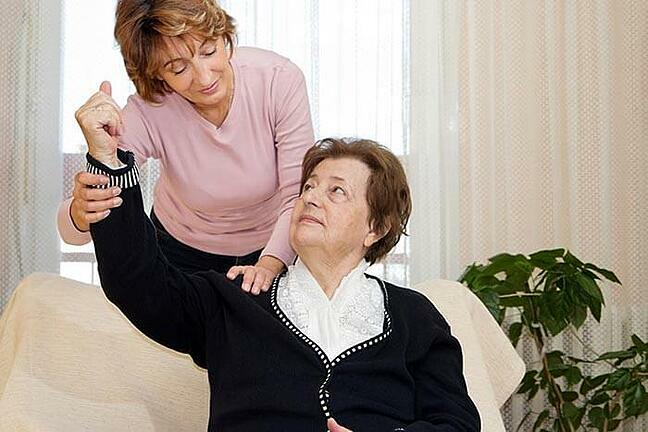 Caregiving is about one person helping another. Caregivers often feel obligated because their parent took care of them—but providing care is a choice. Let go of your guilt, recognize you are not perfect and do your best. And if you lose your temper, forgive yourself. Tomorrow is another day. This makes it easier to understand your loved one’s actions and advocate for him or her. Accompany your parent to appointments, do research online, talk to a care manager and contact your local Area Agency on Aging for resources. This will help you fully understand your loved one. Consider recording and preserving their memories. A scenic drive can be another opportunity to have a heart-to-heart and get outside. And don’t forget to laugh together over a good joke or humorous situation. Find the funny side of caregiving. Believe me, it’s there. Staying healthy helps ensure that you can remain calm and compassionate. Slow down, breathe deep, get plenty of rest, eat healthy foods and make time for yourself to rejuvenate. You have to take care of yourself first before you can provide quality caregiver support to your loved one. Caregiver support comes in many forms. A connection with a higher power can be important in the healing process, and attending a weekly service can provide social interaction. Shelley Webb worked as a registered nurse and geriatric care manager for more than 30 years. After providing in-home care for her father, she established The Intentional Caregiver as a resource to provide education, encouragement and support to those providing care for aging parents and loved ones.